By Manestream, September 16, 2011 in Running Of The Leaves 2011! Rp here your placement post-final segment of the race! Congratulations to all of you who made it through from start to finish! You have three days to RP this section before it closes- any celebrating/post race RP character interaction can happen here before the event is permanently locked! Lampwick felt alive. Her hooves found the earth but barely seemed to touch it- she floated like she was riding the breeze that swept through her mane, slipped along and underneath her, through her legs and over her back, catching her tail for just a moment then gone- this must be what its like to be wind. Her surroundings floated along with her. It seemed like it was all moving in slow motion; but that slow motion was happening really fast. There were so many ponies alongside her- colors of every sort as they dashed towards the finish line. Lampwick watched them- could see the effort of their breath, the strain of their strong legs- the determination in their eyes- it was like Lampwick was so alive that life had nearly slowed to a stop. To one side was a beautiful white and mint-maned pony, shining in the dusky light as leaves whipped around between them. On her other side were some more ponies and a griffon- amongst them a young foal with pastel shades of rainbow in her hair, and the sky-blue pony with the golden Lyre along her flank. Lampwick opened her mouth to say something again, but as the falling golden autumn leaves crossed her gaze and fell in between them, she lost her words and simply watched the beauty of all the motion around her. She couldn't find words, there just weren't any that could do such a moment justice. In silence, but with a peaceful smile, and a burning appreciation for the day in her chest, she watched the mare, griffin, and foal all slip on ahead. Closing her eyes, she took a deep breath- then pushed herself even harder- then felt the rush and roar of the crowd as she bolted past the finish line. Taking a few deep breaths, and feeling the wobbliness in her legs start to take over, she thought it would be best to keep moving- walk off the exertion before her muscles cramped up. She circled a few times in place, watching and listening to the voices of many ponies congratulating one another and receiving medals. How exciting- maybe next year, I can take one home to show Pa! Someday, my treasure chest will be bigger than his; and then-... well, that didn't matter right now- she still had an entire year before heading back home to Canterlot. By then, she'd be ready! Turning away from all the excited hubub- but with a pleased sway in her trot, and the rest of the world at her hooves, she headed down the path out of White-tail wood. Zephyr gave it his all for the last few moments. He wasn't even looking around him, only straight ahead toward that goal line. This was it, that griffon was NOT passing him up. Unless he tripped or she cheated, she wasn't passing him at this point. He wouldn't have known even if she did, his eyes were locked forward and focused on getting past the goal line as quick as possible. There it was, the finish line, it was just a few strides away. Ponies all around were cheering. He couldn't tell who they were cheering for, it wasn't for one pony, it was all so mixed up. So many voices, but it was so exciting. His heart was pounding, he knew he was close to the front of the race. As she made her final push towards the finish line the adrenaline surged and gave Lyra a boost of energy like she'd never felt before. The wind blew her mane in a stream behind her and stung her eyes. She squinted and lowered her head to allow the air to pass over her. Her legs ached from pounding force but still she kept going. She was completely focused ahead. The other competitors may as well have been invisible. Lyra almost felt like a different pony. The idea of winning was exhilarating! Had her mind been clearer she may have wondered if this was how Rainbow Dash felt when she raced. Suddenly there was a brilliant flash of light and a brief resistance to her movement, followed by an incredible roaring sound. She was going to keep going, only to see that there was nowhere to go! A flood of ponies moved towards her, the roaring sound she'd heard being a deafening cheer. Slowing down as quickly as she could, Lyra skidded to a halt. Something white covered her eyes for a moment. Magically lifting it away she saw that it was a long white tape that had caught on her horn. The finishing line... That was the resistance she'd felt. Did that mean...? "Congratulations number 7!" came the voice of a pony wearing a sash denoting her as a race official. "You've finished first and earned a place as this years champion Runner of the Leaves!" There was another bright flash from off to her left, and she saw now that it was a camera pony taking her picture. It had been a photo finish. Another official, a unicorn stallion, brought her a shining gold medal, which he placed around her neck. "I... won? I... WON!?" Lyra couldn't believe it! After all she'd been through! The river, the tree, the mountain, the sap, the other racers. The day had thrown everything at her and yet here she was with a gold medal around her neck and a horde of cheering ponies enthusiastically clopping their hooves and giving her congratulatory slaps on her back. "I can't believe it! I did it! I beat my target! I beat everyone! Oh my gosh I don't know what to say! This is the best day ever!" Lyra bounced up and down in pure joy. Never in a million years would she have expected this and yet here she was, first place! She felt elated and yet... exhausted! She was suddenly aware that she was covered in sweat and that her limbs were aching. The throbbing from the bump on her head had returned and there was a stinging sensation from a scratch on her left leg that she had previously been unaware of. Victory didn't come without it's price, clearly. She flopped to the floor with a feeling of satisfaction. She'd earned this little break. "I can't wait until Bon Bon hears about this!" she said with a hint of smugness. A growling noise from her stomach reminded her that she was hungry. Extrordinarily hungry! Some pecan pie, with ice cream. That would go down a treat right now. Smiling to herself, Lyra wondered if Pinkie Pie had planned an after race party. She couldn't wait! Diamond Tiara sat at the side of the path, not paying attention to the race behind her. She'd wiped the tears from her eyes quickly enough (Nopony would ever let me live it down if they saw that!) and was now staring off into the distance while trying to find a sitting position that didn't hurt so much. The chauffeur had just finished parking his chariot and came over towards her. "Are you okay?" he asked, serious concern in his voice. Diamond merely nodded. "You're a mean piece of work Miss Tiara. I don't agree with what happened but I can certainly see why it did." Tiara scowled at him, though she quickly dropped back into her blank expression. Her heart wasn't in it. "I was only poking a little fun." she said quietly. "Yes, but you went too far and got somepony mad at you. You wouldn't like it if somepony made fun of you, would you?" At this, another tear dropped from the foal's eye. Memories of her cutecenera came back to mind. She shook her head. The chauffeur put his hoof around her shoulder. "I think you've learnt something today. Now c'mon, why don't we get you home?" As the pair moved back to the chariot, Diamond spoke, almost too quietly to hear. "Thank you." "So... what is your name anyway?" The driver smiled. She'd be just fine. "I'm Cloudy Skies, Miss Tiara." "Well, Mr. Cloudy, how about we stop off for ice cream on the way back? My treat." "That sounds delightful Miss Tiara." As the pair flew away, the race completely forgotten, Diamond Tiara thought back on the day. She'd made fun of Applebloom and had paid the price for it. She knew what she had to do now. She was going to make that little blank flank pay! This was her fault and now Diamond was going to make her life for the rest of the year miserable! Mobius panted as he crossed the line, neck and neck with the one and only Big Mac, the Pegasus stretching his head and neck forward as far as he could at the last possible second. The desperate motion barely managed to let him match the large Earth pony as they crossed the line in a tie, his speed immediately dying down as he slowed from a gallop to a canter to a trot and then a walk, moving gradually off to the side as best he could to get out of the way of anypony else who was still going relatively fast. As he slowed, he would nod to Big Mac with a grin. "Good race, Macintosh! I barely managed t' keep next t' ya there at the end," he laughed cheerfully before sitting down, letting out a tired 'woo' as he tried to catch his breath. "Mobius, hay! That was quite the rush at the end, huh? I didn't see the pack come up on us until we were swarmed by them!" Douglas said, his breathing still labored from the sprint to the finish. "I'm shocked we did as well as we did! So you coming back next year?" His ears perked up as he heard the familiar voice, looking up to see the red Earth pony he'd met back at the fork during the sixth section. "Oh, hey, Douglas!" he greeted warmly, offering a wide grin, chuckling at the mention of the abrupt swarm of ponies that closed in on them. "I know what ya mean... I barely managed t' squeeze out of a group'a ponies that huddled in around me. Real hard t' pass ponies when yer boxed in," he laughed softly, giving a shrug, "But hey, it happens in races, right?" He offered a nod in response to the question, his grin only widening. "Of course I'm comin' back! I gotta beat ya at next years race, after all." As he made the friendly challenge, he offered a playful wink, hoping to let Douglas know he was only speaking in good fun. "That is, if yer runnin' next year?" Douglas couldn't help but feel himself let out a quick stretch as he listened to Mobius' answer. "I believe I'll be running again, as long as work doesn't interfere than I'll be here!" Just then he caught something in the side of his eye, a streak of green had passed gently by. "Hay, It was great fun running with you and Survey, hopefully we'll meet again sometime." Douglas said, lifting a hoof to Mobius. "Let's continue this later, alright? I'll see ya around!" Another light laugh escaped him as Douglas' attention was caught by what a quick glance told him was a mare, a wry grin forming on the pale gold stallion's face. "Go get 'er, Douglas. I'll catch ya later," he called to the Earth pony as he trotted off, snickering quietly to himself before looking around for anypony else he knew. He soon took notice of Applejack who wasn't too far away, chuckling as he recalled how she had passed him back on the home stretch. "I'll hafta pay her back once I find my bag," he told himself as he resumed his search, a familiar pale green unicorn coming into view not too far away. Upon seeing him, he waved a hoof, raising himself up slightly. "Hey! Survey!" He called out before getting up, slowly trotting over towards the pale green unicorn with a warm smile. The postrace celebration had begun! The official results were in and Lyra had won the race! As Mojo and his friends entered the ballroom for the Post Race dance, they did so with pride. Mojo ended up tied for 10th place which wasn't bad at all. Minutes before the dance began, the gang arrived at the door. Sheriff Silverstar and Louise LaMare were the first to walk in. Miss LaMare wore a Rarity original design, a dress similar to the one Applejack had wore to the Grand Galloping Gala while the Sheriff wore his best uniform complete with hat. Next came Starflower wearing a dress of light blue to match her felt color followed by Professor Krashkop who simply wore a pokadot bowtie. Jubilee walked in next, wearing a light yellow dress with golden tiara. She wanted to look her best for Hoss. Misty Magic wore a smaller version of the dress Twilight Sparkle wore to the GGG. Mojo walked in wearing several strands of 'love beads' around his neck and a brown vest. The hippie brony was never much for formal attire. Finally, Saddlesore rushed past the entire group and headed straight for the refreshment table. The blue stallion started loading up his plate with snacks before finding a seat. "Looks like that bloke didn't come here to dance!" Mojo laughed. "Seems to be fully recovered," Starflower laughed. "Oh, I hope Hoss likes my dress!" Julibee said nervously. "Oh look over there!" Misty shouted, pointing at Granny Smith, who stood at the punch bowl giving out glasses of fresh apple juice. "By cracky, I made it back here in plenty of time! Brought back two whole kegs of apple juice fer all the racers! COME AND GIT IT!" the elderly mare shouted out. "Mister Pro-fesser, are you sure it were a good idear to give that thar jet pack to Granny Smith?" Sheriff Silverstar asked. "Ja heir Sheriff! I made dee proper adjustments und added safety features. It vas dee right thing to do. At first, I vas going to junk it, but vhen mein cure for poison joke actually vorked, it gave me dee confidence to try again, und I did!" "Me? Sure, I'm cool. There is someone I need to talk to. We promised to talk to each other after the race." "Right Wings. I wanted to congraduate her on her win, and apologize to her for getting the wrong impression from her message. I hope she'll still wanna talk to me after all the acclaim she's received today." 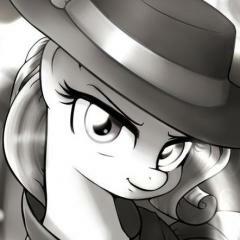 Applejack trotted briskly across the finish line, next to a crimson colored earth pony and a very nicely dressed dog. The score keepers had enough stress on their hooves in determining the winner of the race. So she tied for 12th with the ones that finished close to her. She began talking to herself and she gave her legs the much needed rest. "12th place? Well, that is a he-uge improvement from last years race!" Applejack chuckled as she had seen Granny Smith, in all of her adrenaline, have the apple cart already set up. She had also seen Apple Bloom there next it, not realizing that she had just got done racing on Big Macintosh instead of helping the elder pony with the cart. "Apple Bloom! You came to help with the apple cart, how nice!" Applejack winked at her little sister, assuming that her day's story would completely overshadow the yellow filly's boring day at the farm. "If you keep this up, lil' sis, you'll have that cutie mark in a jiffy." Applejack saw several ponies, all who had their names written down on that piece of paper, honestly give their bits to Applejack for the juice she sold them on the farm section of the race. She recognized their loyalty and refused. "No can do, sugar cubes! You don't worry about payin' me for the apple juice. I was a might confused at the time and should have been racing." Applejack was fealling a little guilty, but only for a second. "In fact, I'd like to give free apple juice to everypony that ran the race right now! So, everypony! Come get some nice cool apple juice!" The apple cart wasn't just filled with juice. It also contained several treats like apple fritters and dumplings, and even a few of Granny Smith's famous apple pies. "Soup's on, everypony!" Survey, heavily panting and sweating was nearing the finish line, noticing a quiet big crowd of ponies already there, he sighed. ''I s-sure am..*pant* n-not t-the..*pant*..w-winner..'' he said with a weak chuckle, as he starts to walk. ''M-might aswell.. *pant* s-slow down..'' he said, grunting and sweating even more. He looked up at the sun, wich was burning on his skins, drying the icky substance on his flank and hooves. He switched his view back to his cube, wich was slightly covered into with the substance too. ''Y-you are going t-to get some cleaning a-at home..'' he said giving a slight chuckle. He looked back at the finish line again as he heard Mobius calling out for him. ''H-h-hey..!'' he yelled weakly. He slowly crossed the line, callopsing on the ground. He let out a groan and slowly levitated the cube back infront of his face, as he starts solving it. ''A-atleast i f-finished, r-right M-Mobius?'' . He slowly poked his head back up, as he looks at Shanna, who finished after him. He let out a small whine as he stood up again, and trotted over to her. ''S-sorry... f-for.. *pant pant*'' he said, as he fell on the ground again, letting out another groan. ''S-s-sorry..'' he repeated, looking up at her. Upon arriving at the celebration he was unsure of what to do, or who to talk to. and chose to just sit at the side and watch for now. it had been a long day for him, but he thought back at the beautiful views he had seen that day. The soothing river, flowing with a bright shimmering light. The leaves, falling and shined against the suns rays in their various colors. The trees glistening in the autumn day, with the sweet smell of syrup up and about. and who could forget the breath taking view of which was seen from up atop of the mountain pathway? The vast and gorgeous field of autumn trees, with its various red and orange leaf colors. Shanna looked around at a nervous voice in the milling ponies and saw a light green unicorn near her, the one she had run across the line just behind. She cocked her head to the side. "Sorry? For what?" She took a moment to stretch her right wing, working some of the sap out of the feathers. "..ow.."
Meanwhile Hoss found the wash area with canvas screens and wooden barrel showers and baths and got himself more presentable, careful of his bandaged hoof. He strode out, feeling much better, and wearing a dress collar and cuffs from his saddlebags. Hoss took off and flew to the ballroom to spare his hoof, tucking and diving through the door. Spying Jubilee, he set down before her. His eyes bugged out as he saw how amazing the blond maned mare looked in a matching dress "Oh Wings! You look fantastic! How do I look?" Survey sighed. ''F-for s-sort of..'' he gulped. ''B-being e-earlier t-than y-you..'' he said a bit weakly. ''I d-don't like.. w-winning...'' he said, chuckling nervously, thinking he sounded dorky again. He coughed, and looked away, blushing a bit. ''F-from a m-mare.. n-non the l-less..'' he said, chuckling again. 27th place? Well at least it wasn't last. And Wisp was happy for that. She was also happy with was over. She knew she still had sap all over her, and sticks in her mane and tail. Yet everypony was gathering around now to congratulate each other on the run. She just wanted to sleep. It was long, tiring and in the day time too boot. But, she needed to be a good sport so less would think of her as just "that creepy pony in the haunted house." "Apple juice?" She heard Applejack call out and slowly made her way over toward the chart. "You wouldn't happen to have any lemon juice would you?" Shanna blinked a few moments then smiled. She walked up and gave him a friendly nuzzle "Aw, that's vey sweet of you. I'm Shanna by the way." She stretched a leg, and felt the joint pop "Ooof! Honestly, as long as Gilda hasnt' won after cheating like that, I'm just glad to have been in the race with so many friendly ponies. I've actually made friends during the race and am proud so many ponies pitched in to help on that sticky stretch." She smiled at Survey "May I count you as a new friend as well?" As Seeker crossed the finish line, all the exhaustion of the race fell back on him. He didn't even cared how he placed, but did notice with some satisfaction that there were still Ponies finishing for a while after him. Looking for a shady place, Seeker lay down in the shadow of the nearest house. Taking of his goggles, he noticed that he had lost his number. Oh well, it didn't matter. He wasn't even sure what they were used for. Checking trough the things in his bags, Seeker had the distinct feeling something was missing, but he couldn't put his hoof on it..
Blacky was at the mountain pass they entered earlier, but the smell of tree sap was still overwhelming. He remembered hearing water nearby, and it had been quite a while since he last drank. Sniffing around, the dog made his way up the path, following the fade sound of flowing water. He jumped up, looking about. There was no sign of him, but several of the ponies around gave him surprised looks. He whistled. No answer. Still frantic, Seeker ran up to the nearest group of ponies. "Have you seen my dog? He followed me during the race. Short, black hair. My Blacky." If his mind hadn't been so preoccupied at the moment, Seeker had probably noticed that he was still covered in several layers of mud, tree sap and leaves. Gilda ran like mad as the finish line grew ever nearer. She was going to win. She was going to beat them all! As the pack of racers tightened as they rushed toward the race's end, she was positive her final burst of speed would put her up on top. She was going to prove herself to them all. To the green pegasus, to that colorfully-mane unicorn who had confronted her many times, to that insufferable Pinkie Pie, to none more then Rainbow Dash, wherever she was, to all these ponies she was going to prove her greatness. She could just taste her victory. They crossed the finish line, the sound of hooves stampeding drowning out almost everything. Then an official announced the race's winner. Gilda was stunned. She had failed. She watched as some unicorn she had never even noticed, a green mare that had never once been ahead of her was crowned the victor. Gilda was aghast. She just couldn't believe it. A seventh place medal was awarded the griffin. Seventh!? That was impossible! After all that... six ponies had finished ahead of her? Gilda didn't even know what to think. She looked at the ponies who had beat her. It was mostly the familiar faces who had been at the front of the pack along with her. He was there. In second place. The green pegasus had finished ahead of her. Not only had Gilda lost the race, she had lost a personal challenge from a pony. Gilda stood there still, probably looking stupid. The wound to her pride was deep and painful. She had had so much to prove and yet here she was a failure. At that moment, she didn't even know how to react. Carrot Fields kept walking in circles for a while, waiting for his breath to ease, his heart to realized what the rest of him already had - that it didn't have to keep racing. He looked around at the other contestants - there hadn't been many there when he'd run in. So he didn't have first, but where *did* he come in? He supposed he was a little disappointed that he didn't have first, but not too much - he knew that he had lost a lot of time helping ponies, and he wouldn't have given that up for anything. There was Lyra! She had been up in the front pack, how wonderful! Good for her! And there was the orange earth filly coming in over the finish line, wonderful! Good to see she wasn't slowed up too much by her problems! He ducked out of sight as she looked around, nervous - after being asked to choose, and not choosing either side, he was sure she wouldn't want to talk to him. He sighed softly. Oh, wow! Out of all those big stallions, all those athletic earth ponies, Lyra had won? That sweet little mint colored unicorn had outraced all the others! He let out a delighted laugh, and let a broad smile cross his face. Well, good for her! And after having knocked herself loopy, too! He looked around for her to see if he couldn't find and congratulate her. He was a little nervous about it - he had left her during the race, and he'd heard her calling to him while he was running, but... oye. What a strange race. Ah, there she was! He trotted up to her, still feeling a bit sore. "Aye, Lyra! Giddae, ye ran a great race! Oi'm roit cheery tae see that ye did sae well! Giddae, an' Gid job! Guess ye dinnae need moi help after all! Oye, ye would nae believe all th' strange things wot happened durin' th' race! Congratulations!" Bramble Rose lay there in the grass for a long time, taking long, deep breaths till he started to finally settle down. He'd done it! He'd finished! Ooog... weren't ponies supposed to exercise because it made them feel better? he felt sore all over... he'd always thought of races as being ... running. Not all of that ... everything else that happened! Races were a lot more interesting than he'd thought they would be! Slowly, carefully, he got back up to his hooves, with a soft groan. Oooo, golly... he wanted to sleep for, like, a week. He limped his way over to the board and looked up to try to find his name. Ah, there he was, number 13 - Willow Wisp?! That wasn't his name! He puffed up his chest in indignation. How could they have gotten his name THAT wrong?! And he thought he'd done better than than 27th! Wait... there was his name up there! Under number... also 13? What a confusing thing. He though numbers were supposed to be unique - the whole point of having them. Well, whatever. 18th, not bad! Maybe if he practiced, he'd do better next year. He looked around for Ginger Mint. He had no idea how to get ahold of her, so he wanted to make sure they set a time and place for their date before they left the race grounds! He spotted her soft coloring through the gathering crowd of ponies and made his way over. "Ah ... hello!" Bramble said brightly. "Great job on the race! Wish I could have kept up with you!" He paused a moment. What did ponies say, at this point? "So, um ... I don't know if you're looking for tea now, or later... we're both kinda tired just now, I'm sure... when and where did you want to do that?" As Carrot Fields was standing there, talking to Lyra, a flying purple blur suddenly tackled into him. Purple Haze excitedly cried, "Ah, gid job, big brae! Ferth place's nae tae sneeze at! Ye ran a gid race, ye did! Think it'll help us sell carrots? Tell me bout th' race! Did anything exciting happen? Did ye meet this filly on th' race? Did ye invite her over fer dinner, yet?" The questions spilled out of the little filly, as she excitedly bounced up and down next to her big brother. Jubilee blushed slightly at the compliment she had just received from Hoss. "Thank you, Hoss, you look great too!" the blonde Pegasus mare neighed. "Want to get something to eat first? I think Applejack has some snacks at her cart and Granny Smith is serving apple juice." "More snacks? Outta my way!" Saddlesore grunted, muscling his way past Hoss and Jubilee to go out the door and over to Applejack's stand, where Misty Magic was already there. "I would like one apple fritter and a glass of apple juice, please," the young unicorn said meekly as Saddlesore pushed her out of the way. "Move it, hornhead! I was here first!" the grumpy blue stallion snarled as he grabbed two fritters and took a bite out of each of them. "That was very rude, sir! I was here first!" "Go tell someone who cares, midget!" "Did your parents ever teach you good manners?" "Go away, shortie! Go pester someone else!" Saddlesore grunted while he finished eating the two fritters as he reached for a pie. Misty's anger grew as her horn began to glow. "You are SO ill manneredly! You're acting like such a pig!" Misty was flabbergasted to see that the grumpy blue stallion was now a sizable blue pig who began squealing loudly and running around the courtyard. "Oh no oh no OH NO!" Misty panicked. "I didn't mean to do that, oh dear, this is NOT good at all!" Saddlesore, the pig, ran wildly in circles before going back inside the open door of the main hall. He zoomed past Sheriff Silverstar and Louise LaMare, tripping them both as they toppled to the floor. "HAY! WHAT WAS THAT?" Louise asked. "I don't know but I'ma gonna find out!" the determined Sheriff yelled as he began to pursue the wayward swine. Meanwhile, Mojo began to wander around and suddenly spotted Lyra. "There she is," the hippie brony said softly to himself. "What a lovely mare! Any stallion would be proud to be her colt. But that's not to be for me. Jolly well better get this over with." Nervously, Mojo approached her, putting a wide smile on his face. "Lyra, you ran a sensational race and deserved to win. Sorry for the little misunderstanding earlier..."
As Shanna waited for a reply from the shy unicorn before her, she spotted the grey pony with the star-carrot cutie mark she saw in the race and waved at him with a wing tip. Not having been in the race before, she had not yet realized the judges had posted the results. Elsewhere in the herd, her brother nuzzled the white pegasus mare with a blond mane, Jubilee. He smiled a her and brushed his wing against hers. "Yeah, that sounds great. I've heard of their awesome food but havent had any before, so now would be the perfect time to try it out." As they got into line, he saw Saddlesore getting rude with Misty Magic and suddenly become a blue pig. He flapped into the air to avoid being run over "WOW! remind me to never get her mad!" Jubilee also flapped upward to avoid Saddlesore pig. "Oh, poor Misty," the blonde maned Pegasus said sadly. "It was probably another one of her magical mistakes. Misty's not mean or cruel, she's very nice. She can't help it her magic acts up sometimes without her knowing it. Maybe we should help round up that runaway hog." "Already on it, miss," Sheriff Silverstar neighed as he continued chasing it into the ballroom and back out again. Meanwhile, back at the punchbowl, Professor Krashkop walked over to where Granny Smith was serving. "I vant vone apple juice, please," the gray maned Pegasus stallion said. "Hay thar, sonny!" Granny Smith neighed. "Yur the feller that gived me that thar jet pack! Can't thank ya enough fer it!" "You are velcome, fraulein Smith." "You ain't half bad fer bein' a funny soundin' fer-in-er,"
"We is probably the oldest ponies at this here event." "I vonder if Princess Celestia vill come visit us? She vas here at dis event last year." "Would be nice to see her." Holly Dash, just trotting across the finish line, realized something suddenly. There were only two ponies ahead of her. She blinked, eyes wide, shock splattered all over her face. She...she had...won!!?!?! A prize?!?! Like...not just a participation ribbon!??! How was that possible she was--she looked back, and saw Applejack just galloping to the finish line. She must have galloped faster than she thought! She felt bad again--she had left behind another friend she had just made. She didn't even hear the congratulations that was offered to her, and as a unicorn pony approached her, the third place necklace floating within her magic, she turned away and trotted back to Applejack, who had tied with two other ponies for twelfth place. She approached, head low, and apologized. "Ah...Ah'm so sorry, Applejack...after what ya did for me, and then Ah just left ya in the dust like that...." She pawed the earth with a hoof, "Can ya ever forgive me?" The frustrated unicorn pony had caught up with Holly and had a twinge of annoyance on her face, "Congratulations, number....uh...number...." She looked at Holly's flank, and there was no number. "Oh, ponyfeathers! It must've fallen off when Ah landed in that sap....." She muttered, sure that she would not even get her reward now, what with her number missing. The unicorn just smiled, "Oh, don't worry so much! We've heard various announcements throughout the race on placing, so we know you've been in the race this whole time. Now, if you wouldn't mind..."
"Yes, Ma'am!" Holly put her head up high and proud, and allowed the unicorn pony to slip the 3rd place medallion around her neck. With wide, proud eyes Holly looked down at the gleaming bronze trophy, and realized something else, too. She had beat that griffon! So tired. A few ponies came rushing toward the top 3 runners, Zephyr being one of them. With a wave of his hoof, he gave an unspoken signal that he was okay. He was out of breath and would celebrate later. Excitement rallied all around him. He was just as excited, but the aching in his legs and body had caught up and for the moment, he just wanted to rest. After a moment, a pony had gotten too excited and impatient, she didn't want to just hand him the 2nd place award like that. With the help of another pony, Zephyr was lifted to his hooves and a silver medal was placed around his neck. He had never been part of anything like this before and with it came a wonderful feeling of victory. A smile formed on his face and he saw that he would take in the excitement of the moment. "You're a great runner..." He paused a moment, letting his compliment set in. "There was really no need to try and cheat or hold any others back like you tried with your rock stunt. You can do great on your own. Next time we race, I'd like to see more of that running potential without any attempts to cheat." He kept a smile and extended his right forehoof in greeting toward the griffon. "I'm Zephyr Burst." He knew there was no need for taunting or anything else of that sort, and had every intention of making friends with the griffon. Or at least making sure there was no bad feelings between the two. He simply wanted to leave it at friendly rivals in a race at best or worst... he wasn't sure, he just didn't want to end anything on a bad note. GIlda watched as the pegasus approached her and began to speak. She still just couldn't believe this guy. What was his deal? "Tch! You really think I want to hear junk like that from a loser pony like you!" Gilda retorted, angrily, still not believing she had lost to this pony. "Zephyr Burst, huh? I'll remember that dweeb name of yours! Next time we race, you are so going down!" She gave a bit of a huff and kicked her foot on the ground. "I'll show you someday that today you and all these other loser ponies were just lucky. Gilda the griffin is really the fastest one here! You can count on that!" He looked back at the finish line again as he heard Mobius calling out for him. ''H-h-hey..!'' he yelled weakly. Chuckles at the question, nodding as he came to a halt next to Survey. "That's right. Ya stuck through it 'til the end. 'N ya did pretty well, considerin' it was yer first time racin'," He nodded before giving the timid unicorn what he considered a gentle pat on the back, not considering that it might be a bit rough to the slightly smaller built stallion. "Hope ya race again next year. Heck, if ya'd like, I could train with ya for the next one." He then noticed his friend's attention being stolen away by a mare, grinning wryly before winking at him. "I'll leave ya t' yer ah..." Glances at the mare in question before chuckling, "...post-race celebrations, though." With that, he got up on all four hooves and trotted off, still chuckling softly as he set about looking for his saddlebags. Shanna gave a soft giggle at that gentle barb by the tan pegasus, Mobius, and now she knew the green unicorn was Survey but she poitely waited for him to say so, smiling encouragingly as she saw how shy he was. "Speaking of celebrations, will I see you at the party later, Mr...?" Meanwhile, Hoss hovered next to Jubilee as they watched the baconated Saddlesore rampage around "If they are sure they have him in hoof.." He sighed, knowing he couldnt' leave it at that. "But I think there would be less risk to my sore hoof if we were to toss ropes on him from up here..."
He hmmed and tossed his tail "Welll... maybe if there's a pole to tie the other end to so we arent jerked out of the air?"